With summertime almost officially here, my family has been spending more time enjoying the long days in the warm sun, which unfortunately often spells disaster for one of us. Someone is always bound to get sunburned. Think painful, sun-scorched skin. Ouch! Aromatherapy can be a great solution, since many essential oils have therapeutic actions that are especially healing, such as reducing inflammation, relieving pain, and preventing infections. In addition to being great for the skin, some of these oils, such as frankincense, lavender, and neroli, are calming to the nervous system, so they help you feel better and relax when you’re feeling miserable with a really bad sunburn. Not only that, but when they aren’t being used for skin care or other therapeutic benefits, a couple of them (e.g., lavender and tea tree) are especially great for green cleaning as discussed in my article, “Top 5 Essential Oils to Use in Your Green Cleaning.” So you will definitely find many uses for them! All of them are great for the skin, but if you must start with only one, try a good quality French lavender essential oil. It’s helpful for not only sunburns, but also for rashes and insect bites. And it’s very easy to carry a bottle around in your purse, briefcase, or beach bag. That way you’ll always have it on hand for quick fixes for many ailments. For treating sunburns, the therapeutic essential oils noted above may be mixed into a bath, compress, body spray, or aloe vera gel as described below. For children or the elderly, cut the amount of essential oil recommended in the treatments below in half. For very young children, use 1/4 to 1/5 the recommended essential oil dosage. Effective for sunburns or rashes, this is a skin-soothing and relaxing, easy bath to try. Blend in 9 – 12 drops of essential oils helpful for sunburns to ½ cup of ground oatmeal flakes (use a mortar and pestle or coffee grinder) or one packet of colloidal oatmeal from your local drugstore. Mix well and add to a cool bath. To make an aromatherapy compress, add 5 – 6 drops of essential oils used for treating sunburns per cup of cold water. Add the water to a bowl with a few ice cubes in it and stir well. Submerse a soft cloth, wring it out, and gently apply it to your sunburn. When the cloth gets warm, dip it into the cool water again and re-apply as needed. This easy-to-make spray is especially cooling and soothing to the skin when refrigerated. Simply add 10 drops of essential oil (e.g., French lavender) per ounce of distilled water into a glass spray bottle. As an alternative, try cooled green tea, which is full of skin-healing antioxidants, in place of the water. Shake well and spray onto tender skin. Keeps in the refrigerator for up to one week. In the palm of your hand, blend 2 – 3 drops of lavender essential oil with approximately one teaspoon of aloe vera gel or fresh aloe pulp. Apply as needed. Note: Some essential oils are contraindicated in pregnancy and for those with certain medical conditions. For more information, check out this article on safety by the National Association for Holistic Aromatherapy (NAHA). Caution! Although essential oils are natural substances, they need to be handled carefully. If you get essential oils in your eyes, flush well with water for 10 -15 minutes and seek medical help if irritation persists. If skin contact occurs, wash well with warm soapy water. No need to worry about lavender, though, as it doesn’t harm the skin, but is often used “neat” (i.e., applied directly) in aromatherapy. Caution! Always store essential oils tightly sealed in dark-colored glass bottles at room temperature or slightly cooler. Otherwise, as in the case of tea tree, if stored in high heat or clear colored bottles, the chemical constituents may change causing sensitivity in some people. © Karen Peltier and Well Gal, 2012 – 2015. All rights reserved. Photo © Karen Peltier and Well Gal, 2012 – 2015. All rights reserved. ← Freshen Up Your Cleaning Routine with Lemons! Karen, Great information! I love essential oils and use them daily for everything! 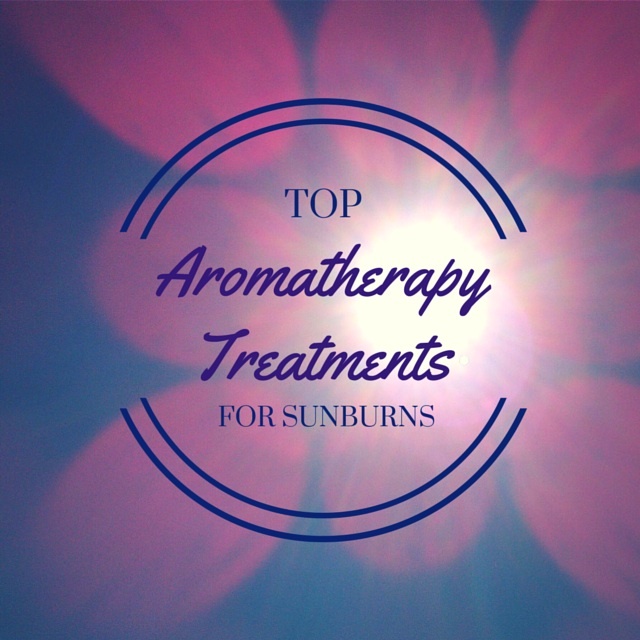 My favorites for sun are lavender, frankincense and tea tree oil. Thanks for the fantastic post! However careful we are, the Australian sun can be vicious, so this information is really useful. I always make sure we use high protection suncream and the kids were in general very good at applying it when I wasn’t there. It was teachers who didn’t give the kids time to put it on that was the problem. I think that inexcusable in this day and age. What do you recommend for mosquito bites – one look at me and they make a “bee-line” for me. For mosquito bites, check out this effective DIY clay mask treatment recipe. It works really well. I always have it on hand since mosquitoes love my daughter as well! In terms of keeping the pesky little fellows away, some holistic health practitioners say a B complex supplement may help; however, in reviewing some scientific studies testing this claim, such as this 2005 study published in the Journal of the American Mosquito Control Association, it doesn’t appear to work well. Still, there are various kinds of mosquito species around the world and we are all very different, so it might not hurt giving it a try!